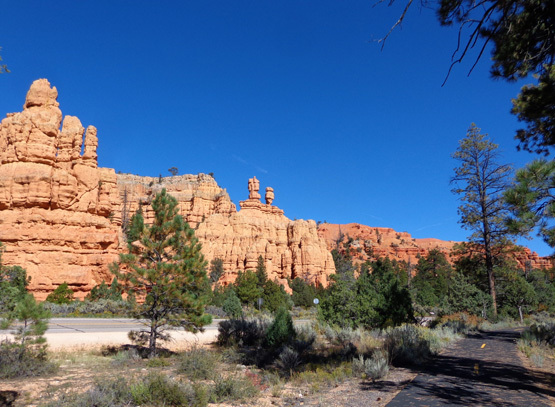 BRYCE CANYON BIKE PATH, THUNDER MTN. and you miss all that you are traveling for." 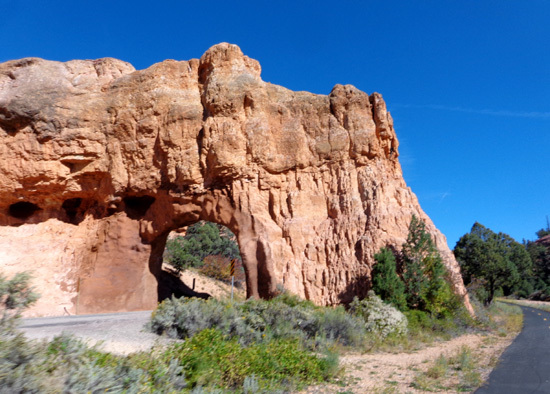 Jim's the main cyclist in our family and he found plenty of places to ride his mountain bike in the Red Canyon-Bryce Canyon area for a month. 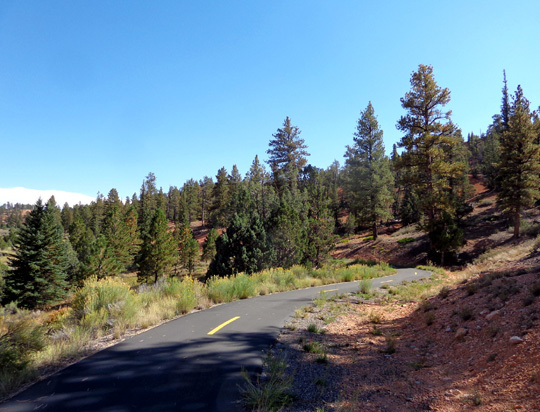 he often drove a couple miles to the nearby trailhead for the nice paved Red Canyon Bike Path, which courses up through the canyon for five miles and beyond. Several times he took her for five- to ten-mile run-rides on the bike path. Above and below: All done. That was fun! Casey enjoyed those rides not just because of the exercise, new scents, and Daddy-time, but also because she'd get to see other people and dogs on the bike path. She's quite the social butterfly. 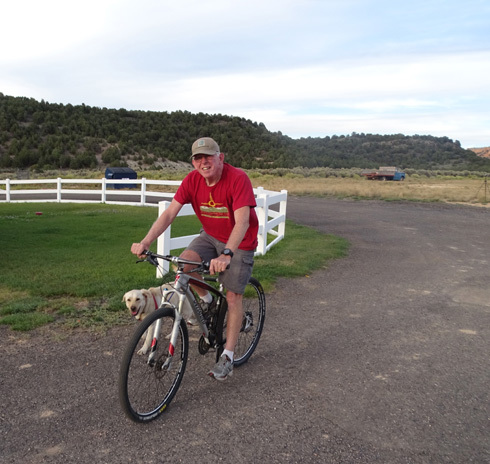 Jim also rode with her several times on quiet residential streets in Panguitch. They'd often begin or end a ride with a ball-throwing session in a grassy area near a horse farm. Casey likes horses, too. 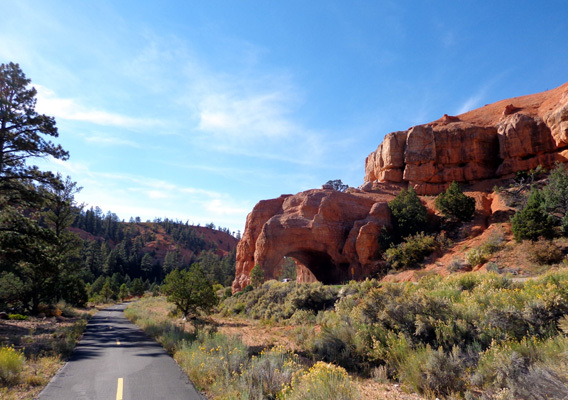 In this entry I'll show more photos where one or both of us rode on the bike path, which extends to and through part of Bryce Canyon National Park, plus dirt roads in Red Canyon and on the plateau before Bryce Canyon and the Thunder Mountain Trail in Red Canyon. 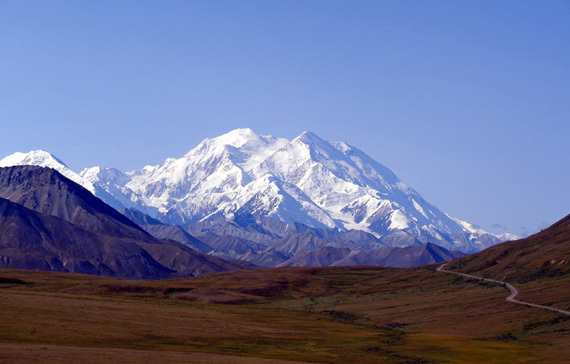 I don't have photos of all the places Jim rode. 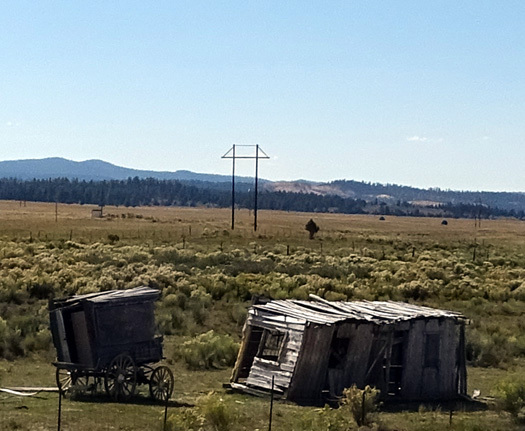 He seldom took pictures when he was riding, except a few from high points on the Thunder Mountain Trail. 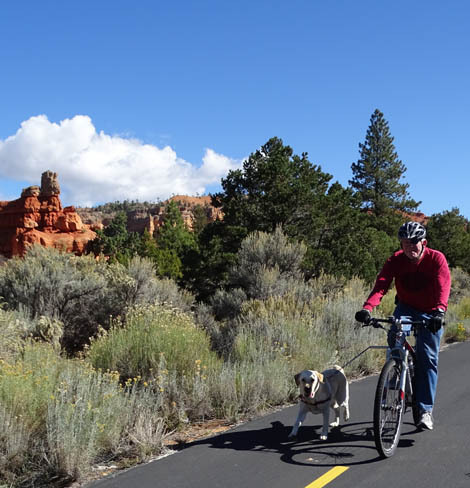 Jim rode most of his cycling miles on the nice paved bike path that winds up and down through Red Canyon. 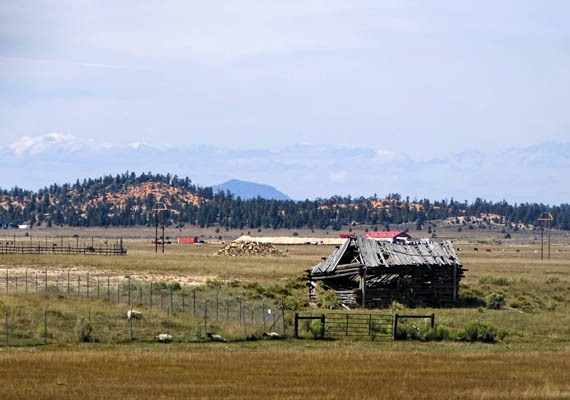 It continues next to Scenic Byway 12 across the Paunsaugunt Plateau and along the access road to Bryce Canyon National Park for another twelve miles, plus at least five more miles inside the park -- a total of 23-24 miles one way. 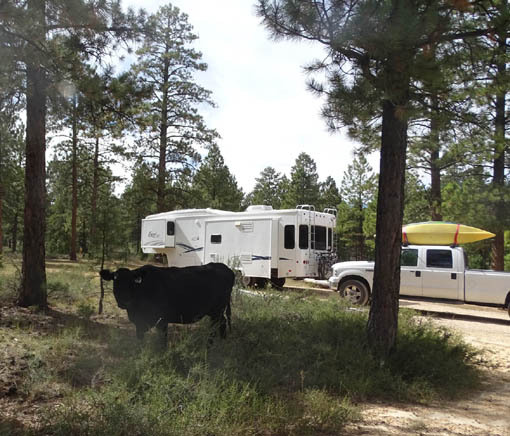 That was his favorite long ride in this area and it was very convenient to the campground. 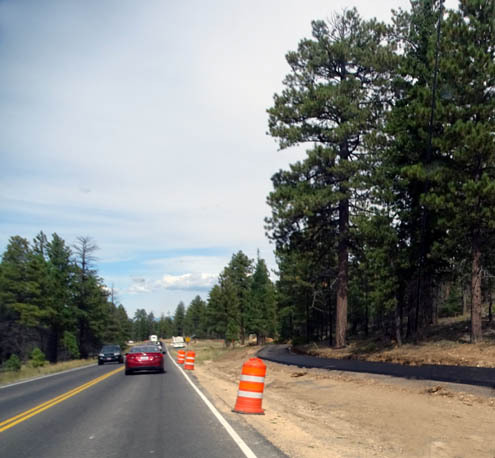 In addition to that, he could have ridden lots more miles on paved roads inside the national park but didn't because of traffic. 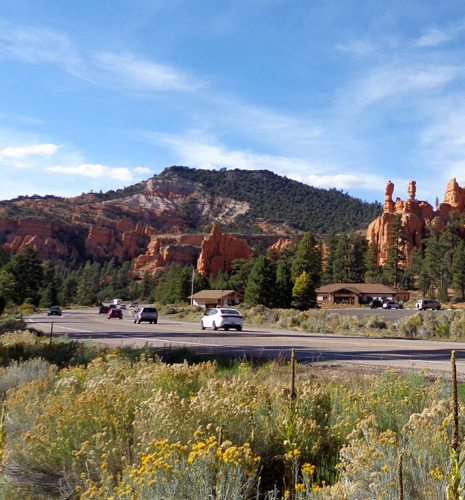 At the time of this visit the bike path was finished from the entrance to Red Canyon (i.e., near our campground) for only about 14 miles. The last 9-10 miles were graded and the dirt was packed sufficiently for Jim to ride on it when crews weren't working on the unfinished parts inside and outside the park. 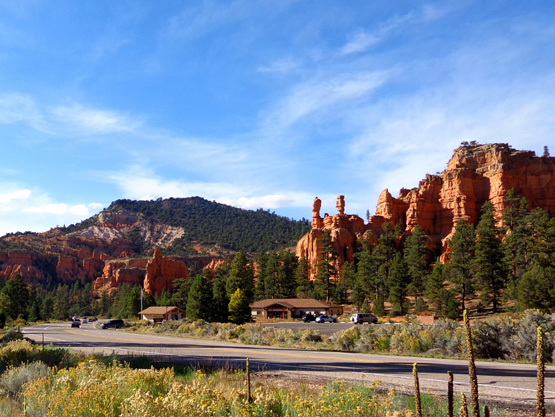 I've mentioned that I drove up to Bryce Canyon National Park several times a week to hike. Most of the time Jim went with me and either hiked or took his bike so he could start riding from the park. He liked riding back out through the park on the unfinished bike path and "down" to our campground. 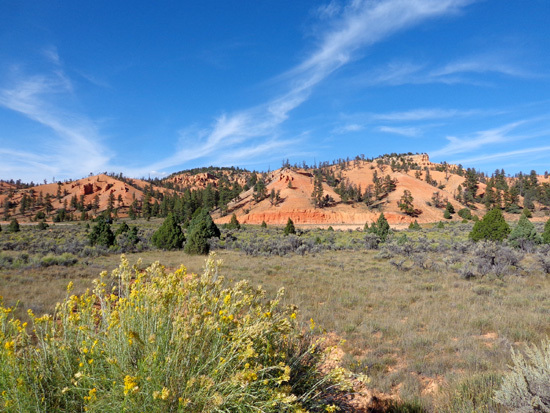 I put quotes around "down" because although it was a net downhill ride from about 8,200 feet to 6,700 feet, the only real descent was in the last seven miles through Red Canyon and on Hwy. 12. Going that direction (north, then west) there are some uphill sections through the park and across the broad plateau before reaching Red Canyon. The two photos directly above, and the next two below, are ones I took along the upper parts of the path when I was driving. 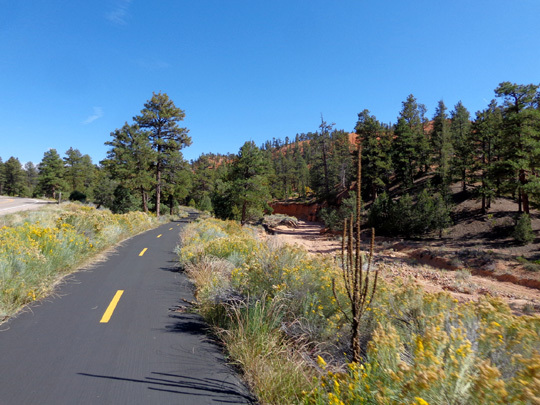 This fall I didn't ride anything on the bike path except the part through Red Canyon. 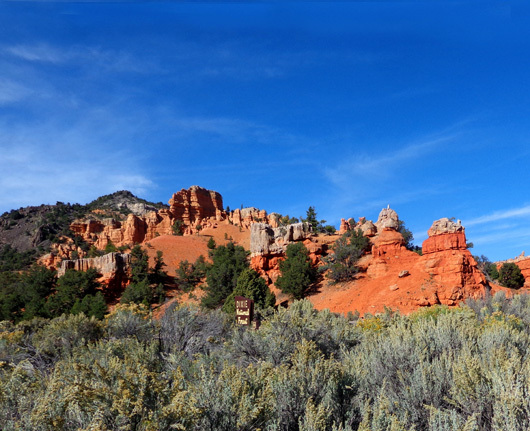 I took the remaining photos in this section on an up-and-back 10-mile ride I did just through Red Canyon. That day my GPS recorded 6,858 feet at the lower trailhead and 7,573 feet at the top end of the canyon where I turned around. 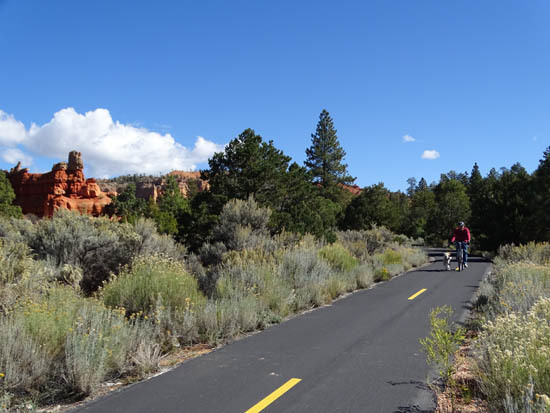 Some of the bike path through Red Canyon is farther from the busy highway, so it's quieter. 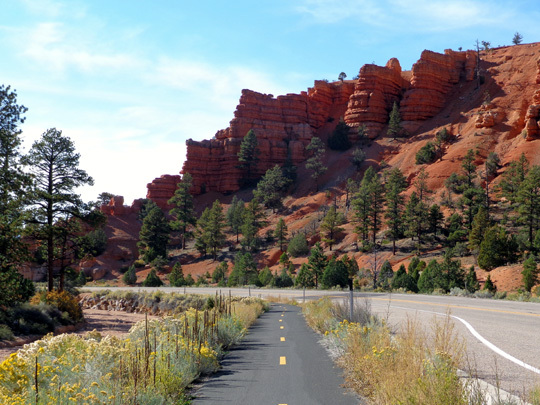 The interesting red-rock scenery helps distract riders (and hikers) from the traffic where the bike path is close to the road. 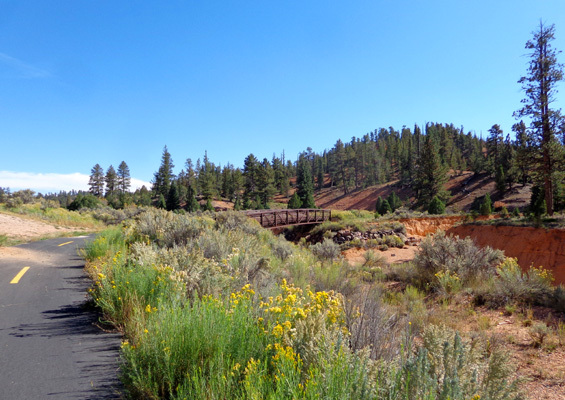 A bridge crosses the wash and the upper two miles of trail are farther from the road. 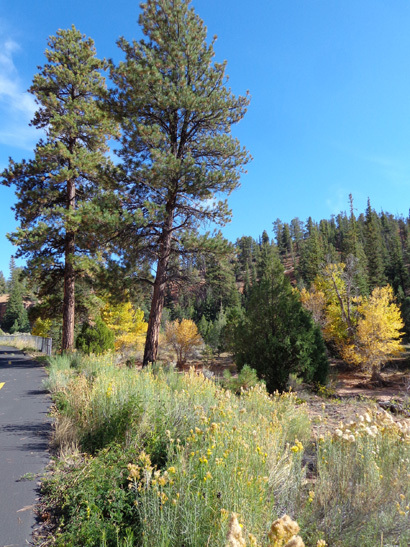 We often saw other road cyclists and mountain bikes on this scenic path, as well as people walking. 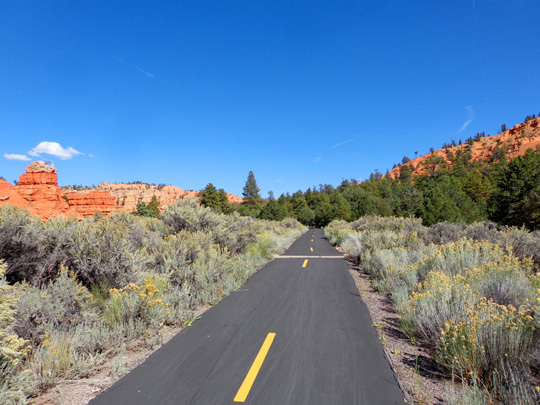 The path goes right by the Forest Service campground in Red Canyon so it's a good way for people who are camping to access the visitor center and various trails. 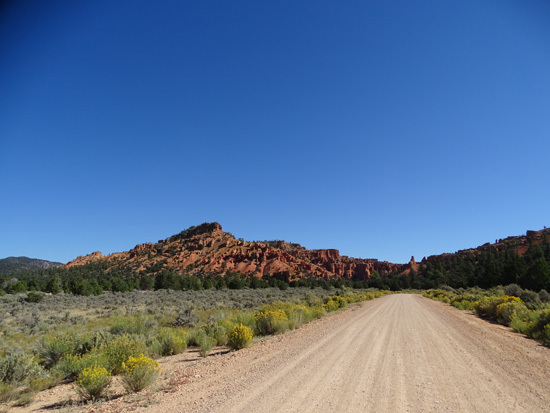 There are a bunch of Dixie National Forest roads in this area that are great for mountain biking, off-road vehicles, and 4WD vehicles. The two roads I talk about below are accessible to 2WD vehicles like our Odyssey minivan, too -- at least when they are relatively dry. 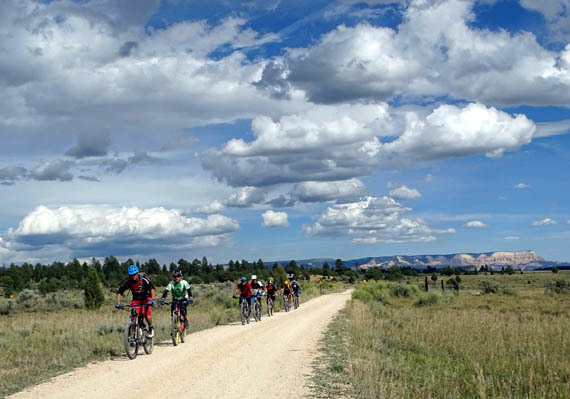 Another dirt road that cyclists often use is Coyote Hollow. 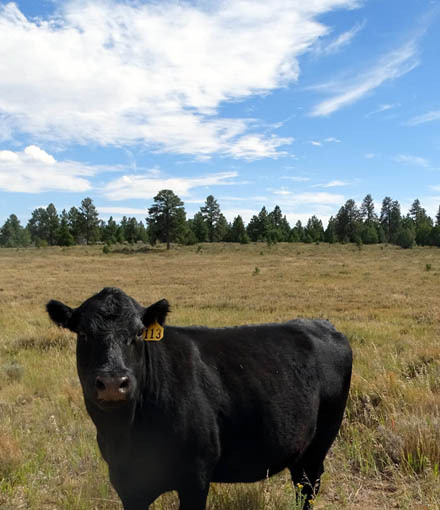 It's on the plateau near the "top" of Red Canyon and runs south off Hwy. 12 for a couple miles to the upper trailhead for the Thunder Mountain Trail. There are parking areas at Hwy. 12 and at the Thunder Mtn. trailhead. 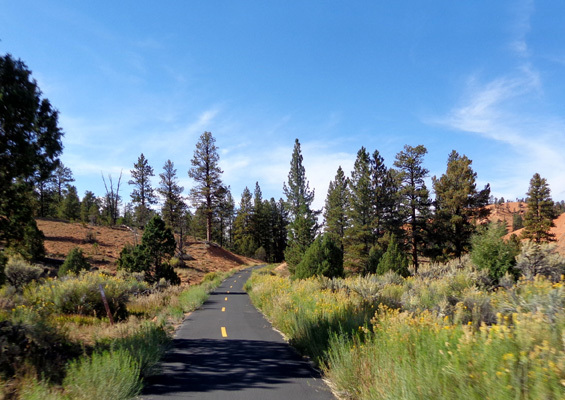 Many cyclists do either a clockwise (easier) or counter-clockwise (more difficult) loop that includes the paved bike path, Coyote Hollow Rd., and the Thunder Mountain Trail. 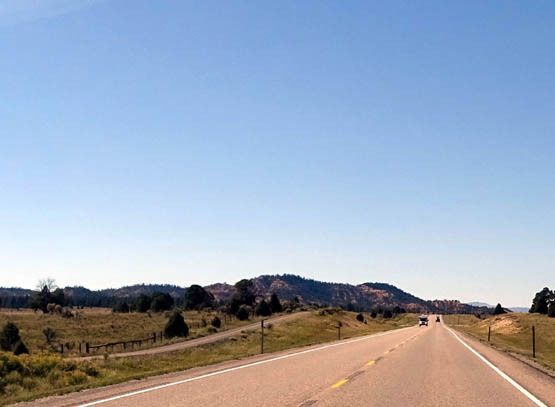 The total distance is about 15 miles. There are lots more dirt roads north and south of Hwy. 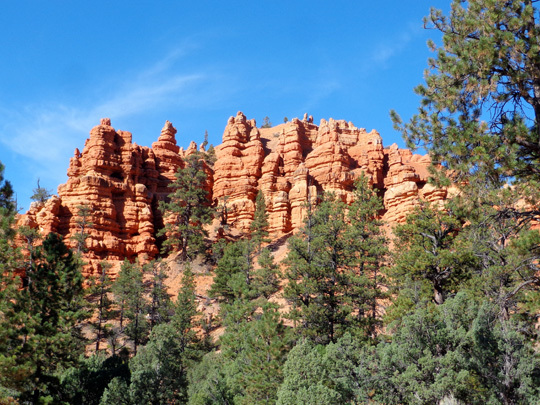 12 between Red Canyon and Bryce Canyon, as well as the lengthy Fremont ATV trail. Bikes are allowed on all of these roads.